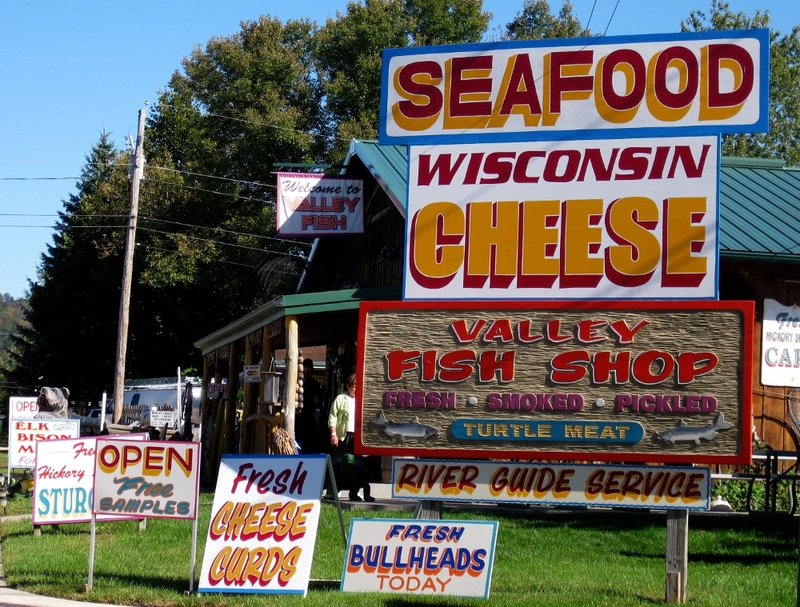 On our way back from Iowa the other week, passing through Prairie du Chien, we spotted Valley Fish & Cheese (it was hard to miss) and we had to stop. You see, one of the quandries about being into local food and living in Wisconsin is the distinct lack of seafood options. We’re trying much harder now to make full use of what we do have here, namely freshwater fish. I’ve been on the lookout for a good smoked fish shop near our house ever since we stopped in Calument Fisheries in Chicago. We didn’t just stop in because of the Free Samples sign (although that helped); I had heard about Valley Fish from asking around for recommendations in the area. Mike Valley, the owner, started the shop over 25 years ago and it has become something of an institution in Prairie du Chien. And he is exactly the guy you want to buy your fish from. Mike is a fisherman, and he treats every product like it’s going to end up on his family’s table. Time after time I’ve found that you can accurately judge food just by seeing person responsible for it talk. All of my favorite food producers have a certain far-away look in their eye; they are talking to you but they are thinking about cheese/tomatoes/pears/smoked trout/etc. I guess it’s possible to be really bad at something you’re passionate about, but the fact that he has been doing it for 25 years says something is going right. Valley packs a ton of products into their small space. 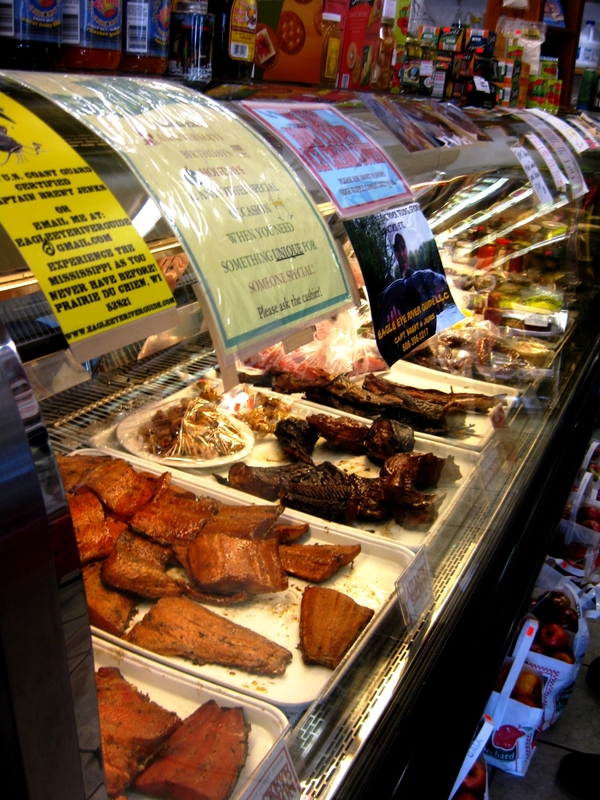 Pictured above (going from lower left to upper right) you see Alaskan sockeye salmon, atlantic salmon, trout, shrimp (behind the trout), sturgeon, catfish jerky (behind the sturgeon), and catfish sausage. All of the fish is smoked on the premises using 100% hickory, and some is locally caught (the sturgeon & perch for instance). They also had several varieties of pickled fish (herring, bluegill, chubs, etc), various jerkies (alligator, snapping turtle, etc), frog legs, frozen trout cheeks, and more. Besides the seafood they had a nice cheese selection, local apples, frozen meats, & drinks. They also had instructional DVDs staring Mike in case you feel like smoking a fish or two yourself. This was all a lot to take in, but we were on our way home from a long day already, so we did a quick pass through the free samples and bought ourselves some catfish sausage and smoked sturgeon. Normally I would have gone for the trout as it’s my favorite, but I was feeling a little adventurous. We used the catfish sausage instead of pork in a bean soup and it was a perfect substitute, bringing a new flavor to a dish we eat quite a bit. The smoked sturgeon ended up in a tasty chowder, which Leslie will describe in another post.